All SCM Certified Coaches, as well as coaches who receive certificates of completion, are required to pledge to uphold the following best practices. 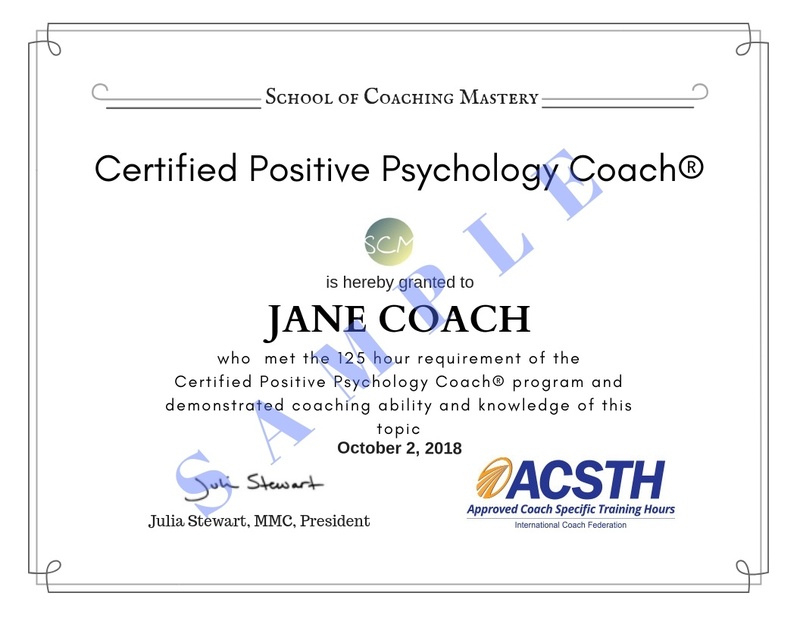 School of Coaching Mastery (SCM) definition of coaching: Coaching is a customized conversation that leads to personal growth and empowers the client to get what s/he wants by thinking and acting more resourcefully. Professional coaches are trained in professional coaching skills. Professional coaches get reputable coach certifications and keep their credentials current. As time passes, they keep their skills up-to-date by working toward more advanced certifications. Professional coaches are life-long learners who stay abreast of new practices in coaching and new research in related fields, including any other areas in which they claim expertise, through additional trainings and seminars, formal degree programs, experiential learning, books, and other learning modes and media. Professional coaches practice excellent self-care, so they can consistently give their best to their clients. Professional coaches work consistently to upgrade their personal development, knowing that personal development is a must for good coaching and that it tends to degrade if not regularly enhanced. Professional coaches hire coaches of their own, especially in their early years of coaching, but also throughout their careers, because it enhances personal growth, reminds the coach what being a client is like, and provides ideas for upgrading their own skills and services. Professional coaches store confidential client records carefully using locks, encryptions, firewalls, etc. and save records for at least ten years. Professional coaches take ethical pledges via professional associations, such as IAC and ICF, or training organizations, such as SCM, and do their best to uphold those pledges. Professional coaches avoid confusing or misleading others about the nature of coaching, or the nature of the services they offer, whether through conversations, writings, marketing, or any other format. Professional coaches, who offer other types of professional services, take care to describe the differences between those services to clients and potential clients and to keep those services separate from coaching by, for instance, setting up separate sessions for them. Professional coaches are aware of and take appropriate care of their mental, emotional, and physical well-being and seek professional help, as needed. They communicate to their clients when they are not up to coaching at their best and reschedule, or if needed, terminate their coaching relationships. Professional coaches who employ assistants, other coaches, marketing personal, etc., require those others to abide by these same best practices while in their employ. Professional coaches transparently communicate their coach training, experience and credentialing; neither exaggerating, nor diminishing their qualifications and abilities. Professional coaches don’t use money-back guarantees to entice clients to work with them, knowing that such guarantees can give clients a false sense of having nothing to lose. Professional coaches always reveal whether they may receive payment in exchange for recommending the products or services of others’, regardless whether payment would be money, service, or some type of trade. Professional coaches neither sell nor upsell during coaching sessions. They schedule separate conversations to discuss additional products or services that the client may want and they are transparent about the nature of those conversations. Professional coaches use marketing tools such as email, social networking sites, teleclasses, webinars, live networking, etc., to build relationships with people, rather than to “squeeze profits from prospects”, knowing that the former attracts clients and leads to coaching success, while the latter erodes trust. Professional coaches only work with clients they honestly believe in. Professional coaches understand that trust and respect are the foundations of effective coaching relationships. They take care to maintain that trust and respect, and immediately address it, if it becomes impaired. Professional coaches always defer to their clients’ desires and never assume that they know “what’s best” for others. Professional coaches fully inform their clients about the services and fees to expect from coaching, before paid coaching commences, and they take care to deliver what they promise. If a professional coach receives a complaint from a coaching client, they do their best to make it right, immediately. Sometimes this might include the return of a fee; other times it may mean clearer communication, or stronger coaching. Professional coaches always use written coaching agreements with ongoing coaching clients, including pro bono clients. Their agreements describe in detail what the client can expect and include a link to the ethical code or best practices to which the coach adheres. Professional coaches who become unavailable to coach their clients for one month or longer, for any reason, refund their clients’ fees for any unused coaching sessions and attempt, if possible, to assist their clients in finding other appropriate coaches. Professional coaches never share personal information about their coaching clients, without getting specific written approval from the clients, first. Professional coaches give advice sparingly, only when genuinely needed, and never in areas for which the coach is not qualified. Professional coaches refer their clients to other professionals whenever the client appears to need help in areas for which the coach is not qualified. This may include other coaches, counselors or psychotherapists, financial advisors, health professionals, etc. Professional coaches never mix multiple relationships with paid client relationships. These include romantic relationships, business partnerships, and any other type of relationship that could cause even the appearance of a conflict of interest. Professional coaches never put profits above client results. Professional coaches never steal the intellectual property of others, but honor international copyright and trademark laws. They create their own material or get the appropriate licenses and permissions to use the work of others.